The latest precious-metal headlines, syndicated from around the world. Starting with a recent op-ed in the New York Times by Bernie Sanders, let’s take a look at various proposals floating around to fix the Fed and other central banks. Mish: That type of populist proposal will appeal to those who believe Wall Street is the problem. It will also appeal to those who understand the Fed is indeed in bed with Wall Street. But we must analyze Sanders’ specific recommendations one-by-one. Economic Illusions vs. Reality; Helicopter Drop, What Else? Without providing a link, ZeroHedge posted some comments today regarding “Helicopter Drop Theory” by Willem Buiter, Citibank’s Chief Economist. We believe that a common factor in the relatively low response of real economic activity to changes in asset prices and yields is probably the fact that the euro area remains highly leveraged. The total debt of households, non-financial enterprises and the general government sector as a share of GDP is higher now than it was at the beginning of the GFC. The wealth effect of higher stock prices appears to do little to boost private consumer expenditure. To the extent that monetary policy has had an effect on real activity, and will have some incremental effect on activity, it may not be entirely sustainable. This is because part of the effect has been by bringing forward demand from the future, such as major purchases, including for cars or construction. That suggests that monetary policy, even if and when it has been effective in stimulating activity, will run into diminishing returns even in sustaining the levels of activity it helped to boost. I wholeheartedly agree with every point made above by Buiter. Actually, things are far worse than he stated. The problem is not just in Europe, but everywhere. With their deflation-fighting tactics, central banks have accomplished five things, none of them any good. The solution is not more craziness, but rather an admission that central banks are themselves the source of the problem. Of course Keynesian fools would never admit such a thing. Instead they promote more and more of what common sense and history proves cannot work. Our conclusion is that, in a financially-challenged economy like the Eurozone, with policy rates close to the ELB, and with excessive leverage in both the public and private sectors, balance sheet expansion by the central bank alone may not be sufficient to boost aggregate demand by enough to achieve the inflation target in a sustained manner. This is more than an academic curiosity. Japan has failed to achieve a sustained positive rate of inflation since its great financial crash in 1990. The balance sheet expansion of the Bank of Japan since the crisis has been remarkable but ineffective as regards the achievement of sustained positive inflation and, since 2000, the inflation target. The balance sheet of the Swiss National Bank has expanded even more impressively, again with no discernable impact on the inflation rate. The case for helicopter money is therefore partly to ensure the euro area (and some other advanced economies) reflate powerfully enough to escape the liquidity trap, rather than settle in a lasting rut of low-flation and low growth, with “emergency” levels of asset purchases and interest rates becoming the norm. If, as seems possible, the ECB will increase, in H1 2016, the scale of its monthly asset purchases from €60bn to, say, €75bn, and if these additional purchases are concentrated on public debt, the euro area will benefit from a ‘backdoor’ helicopter money drop –something long overdue. Buiter wants to slay an imaginary monster, deflation. Other than the absolute mess Japan has gotten into as a direct result of decades of deflation fighting madness, what problem has a lack of sustained positive rate of inflation caused Japan? The bank of Japan is now the entire market for Japanese debt. What positive result stems from that? The answer once again is: None. Nonetheless Buiter wants the ECB to pursue the same inane path. There will be no benefit. Leverage will rise, not sink. And to top it off, debt purchases of the nature he wants are likely illegal under the Maastricht treaty. Buiter has learned nothing from history. He ought to look in a mirror, admit he sees failure, and resign. But economic illiterates don’t resign, they just keep promoting policies that both common sense and history show can never work. The simple fact of the matter is “Inflation Benefits the Wealthy” (At the Expense of Everyone Else) . Stephen Roach, former Chairman of Morgan Stanley Asia and the firm’s chief economist, blasts the Greenspan Fed, the Bernanke Fed, and the Yellen Fed in his latest post The Perils of Fed Gradualism. After an extended period of extraordinary monetary accommodation, the US Federal Reserve has begun the long march back to normalization. It has now taken the first step toward returning its benchmark policy interest rate – the federal funds rate – to a level that imparts neither stimulus nor restraint to the US economy. A majority of financial market participants applaud this strategy. In fact, it is a dangerous mistake. The Fed is borrowing a page from the script of its last normalization campaign – the incremental rate hikes of 2004-2006 that followed the extraordinary accommodation of 2001-2003. Just as that earlier gradualism set the stage for a devastating financial crisis and a horrific recession in 2008-2009, there is mounting risk of yet another accident on what promises to be an even longer road to normalization. The problem arises because the Fed, like other major central banks, has now become a creature of financial markets rather than a steward of the real economy. This transformation has been under way since the late 1980s, when monetary discipline broke the back of inflation and the Fed was faced with new challenges. The challenges of the post-inflation era came to a head during Alan Greenspan’s 18-and-a-half-year tenure as Fed Chair. The stock-market crash of October 19, 1987 – occurring only 69 days after Greenspan had been sworn in – provided a hint of what was to come. In response to a one-day 23% plunge in US equity prices, the Fed moved aggressively to support the brokerage system and purchase government securities. In retrospect, this was the template for what became known as the “Greenspan put” – massive Fed liquidity injections aimed at stemming financial-market disruptions in the aftermath of a crisis. As the markets were battered repeatedly in the years to follow – from the savings-and-loan crisis (late 1980s) and the Gulf War (1990-1991) to the Asian Financial Crisis (1997-1998) and terrorist attacks (September 11, 2001) – the Greenspan put became an essential element of the Fed’s market-driven tactics. The Fed had, in effect, become beholden to the monster it had created. The corollary was that it had also become steadfast in protecting the financial-market-based underpinnings of the US economy. Largely for that reason, and fearful of “Japan Syndrome” in the aftermath of the collapse of the US equity bubble, the Fed remained overly accommodative during the 2003-2006 period. Over time, the Fed’s dilemma has become increasingly intractable. The crisis and recession of 2008-2009 was far worse than its predecessors, and the aftershocks were far more wrenching. Yet, because the US central bank had repeatedly upped the ante in providing support to the Asset Economy, taking its policy rate to zero, it had run out of traditional ammunition. Today’s Fed inherits the deeply entrenched moral hazard of the Asset Economy. In carefully crafted, highly conditional language, it is signaling much greater gradualism relative to its normalization strategy of a decade ago. The debate in the markets is whether there will be two or three rate hikes of 25 basis points per year – suggesting that it could take as long as four years to return the federal funds rate to a 3% norm. But, as the experience of 2004-2007 revealed, the excess liquidity spawned by gradual normalization leaves financial markets predisposed to excesses and accidents. With prospects for a much longer normalization, those risks are all the more worrisome. Only by shortening the normalization timeline can the Fed hope to reduce the build-up of systemic risks. The sooner the Fed takes on the markets, the less likely the markets will be to take on the economy. Yes, a steeper normalization path would produce an outcry. But that would be far preferable to another devastating crisis. Roach provides a nice historical perspective but he misses the boat in regards to risks. Not only is the Fed a creature of the Financial markets, it is beholden to the markets. For some treasury durations, the Fed became the market. Unfortunately, it’s not just the Fed. Global imbalances have never been worse. The Bank of Japan is the only market for Japanese government debt. And in Europe, government debt trades at preposterously low and sometimes negative yields. The “Draghi PUT” is at least as big as any PUT by Greenspan. The risk is not that the Fed (central banks in general) will spawn more asset bubbles. It’s far too late to raise that concern. Massive bubbles in equities and bonds have already been blown. Banks that were “too big to fail” are far bigger now than ever before. Beggar-thy-neighbor competitive currency debasement is the order of the day in China, Europe, and Japan. Let’s not pretend we have a choice that will prevent another devastating financial crisis. We don’t. Only the timing is in question. Over a million refugees have made their way to Europe this year. Every country is complaining now, even Germany. So why isn’t anything concrete being done? If Turkey, Greece, or Germany really wanted to solve the migration problem, the problem would be solved. However, there’s too much ignorance in Germany and too much graft money in Turkey. Greece does not have the resources or the willpower to do the right thing: send them back. The Financial Times reports More than 1 Million Refugees Arrive in Europe. The International Organisation for Migration reported on Tuesday that the number of migrants had hit 1,005,504. That is almost five times greater than the total last year, and was the highest migration flow since the second world war. The vast majority of the migrants — 821,008 — arrived in Greece. Almost all of them came by boat, according to the IOM, a Geneva-based intergovernmental organization. Italy received the second biggest total: 150,317. Bulgaria was third, with 29,959 arrivals. German Chancellor Angela Merkel is too damn stupid or too damn arrogant to do anything about the problem. Besides, there’s simply too much money to be made by the Turkish mafia and Turkish banks for anyone in Turkey too give a hoot. As is typically the case, when there’s money to be made, heads look the other way. Such is the case right now with Turkish profits fueling the “Merkel-made” problem. In a scathing explanation (that Merkel will ignore and Western media won’t report on), please consider How the Turkish mafia organizes the trafficking of refugees . His name is Osman. Or, that’s how he introduced himself. He is one of the top members of the Turkish mafia doing business upon migrants and refugees in Turkey. He is not hiding … “If the Turkish government didn’t want us to do the job we do, we couldn’t pass to Greece not even a fly” says disarmingly. He has a store in İzmir selling food stuff. It is a big store in Basmane, the district of Greeks and Jews before 1922, which was saved from the fire. The Turks in the district call him “Damascus”. As they say “there are more Syrians here than in Syria”. However, the picture of the area is not as it was last summer. There are no Syrians in the streets. The municipality authorities re-planted the grass in parks, there is not even a single Syrian. They are being transferred through many ways that show the size and the ruthlessness of the network. So, migrants and refugees have been transported by Osman in areas at the Turkish side, located across Lesvos and Chios, through buses carried by trucks for roadside assistance. Through school buses during the hours that are not being used for the transportation of the kids. Through convoys of private vehicles, which means that even if a car would be stopped by the police, the others could continue to their destination. But there is also … VIP transportation, like of rich Arabs with Russian escorts, even through … hearses! The latest, as Osman says, are expensive services and being paid nearly as much as the trip to islands. But let’s go back to İzmir where we find the base of the network. Under the fear of the measures that allegedly will be taken by the Turkish authorities, after the European pressure, the network has the following plan schedule. On the top stand the members of the mafia. Most of them do this job for more than 20 years. The old times were doing it for a nice daily wage. Now, and especially the latest year, there is too much money in the business and it is worth someone to risk. On the other side of the network stand some locals. They possess some spaces from where the boats can start their journey safely. They are responsible to keep the passage safe and clean. They are also responsible for the training of someone among the passengers on how should handle the boat. Or, they should pay someone, say 100 euros each time, to transfer the boat with the passengers to the islands and return to the base. In the middle of these groups, there are mainly two categories of people involved. The “dealers”, which are those who find “customers” and pass them to the top members of the mafia. They are doing it through Facebook pages, or, phone numbers that are distributed among the “customers”. They “fill” the boat with passengers every time that the top members have one ready for departure. Close to them stand the “bankers” of the network who are responsible for receiving the payments. Anyone who wants to be transported pays them through any way he/she can. With money or services. Jewelry, valuable stones, or even archaeological pieces! From the moment of the payment, he/she has three days to pass to Europe. After the end of the journey, every migrant and refugee calls a phone number and gives a code number which has been provided when he/she paid. Then, the payments are “released” and the “banker” has to pay everyone involved. About 15-20% is being paid to all who are involved to the transportation and the rest goes to the top member of the network, in our case, Osman. “Why do you take most of the money?”, we ask him. He explains that he has too much expenses. He pays for the plastic boats which, depending on their size and the quality of the engine, cost between 800 and 20,000 euro! These are being bought legally. Therefore, the police can’t do anything, even if they stop him while carrying the boats. He also pays the “bankers”. They take between 20 and 100 euro for every payment. They also keep all the money from those who do not call to confirm that they arrived at the destination, either because they have been drowned, or have been arrested by the coast guard and have been sent back to camps in South-East Turkey. Osman is completely informed about the situation in Lesvos. He knows about the accidents, the dead people, the hot spots, and all the problems in the islands. He knows of course very well what happens also in Turkey. For example, he said that during a weekend last month, no one passed to Lesvos because of the presence of Erdogan in the area for the celebration of olive collection. “We should not provoke” says laughing. He says goodbye “because he has work to do”. We ask him if he worries for telling these things to us. He’s not afraid. “I told you again” he says. “If the Turkish government didn’t want us to do the job we do, we couldn’t pass to Greece not even a fly”! Besides, he made a lot of money. “I don’t have to work. Neither my children and my grandchildren. Today, if someone tells me to stop, I’ll do it. But no one tells me …” he says as we leave! A tip of the hat to “The Failed Revolution” for the above translation from the original Greek article that Google translates as Greek Refugee Trafficker Confesses. Amazingly, Merkel’s solution was to get in bed with Turkish prime minister Recep Tayyip Erdoğan, offering Erdoğan three billion euros to stem the tide. Her proposed “solution” is absurd enough, but Merkel also held out a carrot to speed the way in granting 75 million Turks passport-free access to the EU. Even if Turkey does temporarily pen in the refugees, they will be released in a massive flood once Turkey is a member of the passport-free Schengen zone. Existing Home Sales Plunge 10.5%, NAR Blames “Know Before You Owe”; What’s the Excuse for Last Month? Existing homes sales plunged 10.5% this month which the NAR attributes to an initiative called “Know Before You Owe“. Economists, apparently unaware of “Know Before You Owe”, came up with a consensus estimate of 5.320 million sales, SAAR ( seasonally adjusted annualized rate), the same as last month. New closing rules appear to have depressed sales of existing homes in November which fell 10.5 percent to a much lower-than-expected annualized rate of 4.760 million. The year-on-year rate, for the first time since September last year, is suddenly in the negative column, at minus 3.8 percent. The National Association of Realtors, which compiles the report, attributes the weakness to the “Know Before You Owe” initiative which is lengthening closing times and which likely makes November an outlier. The NAR suspects that the sales delays in November are likely to give a boost to December’s totals. Low supply is a problem in the market, at 2.040 million vs 2.110 million in October. Relative to sales, supply is at 5.1 months which, because of November’s sales weakness, is up slightly from prior months. For a balanced market, supply is generally pegged at 6.0 months. Price data are positive, showing some traction with the median up 0.5 percent in the month to $220,300. Year-on-year, the median is up 6.3 percent which is right in line with the trends in this morning’s FHFA report. What’s the Excuse for Last Month? Interestingly, “Know Before You Owe” came into play in October 3. From Bloomberg last month: The number of homes on the market, at 2.14 million, is actually below the 2.24 million this time last year, an unwanted surprise that the National Association of Realtors, which compiles the existing home sales report, calls “disturbing”. Now that the plunge has deepened, it’s no longer disturbing, it’s because of “Know Before You Owe”. I have a simple question: If “Know Before You Owe” took place effective October 3, and that’s really what’s to blame, then, why wasn’t there a huge plunge last month instead of a “disturbing” surprise? Since not even the NAR seems to understand the implications, let’s take a step back with a peek at Know Before You Owe Mortgages as seen by PBS. If there were first month glitches, why didn’t they turn up a month ago? Let’s turn to my report from a month ago for more details about recent trends. Please consider Existing Home Sales Decline, NAR Calls Report “Disturbing”; First Time Buyers Decline Third Year; Housing Clearly Weakening. If there was an “outlier“, perhaps it was the September gain, not the August and October declines. And even though September sales data bounced, prices didn’t. The median price declined 2.9% in September. October wiped away all of September’s good news and then some. 1.060 million starts was far below Econoday Consensus Estimate of 1.162 million SAAR and also well below the lowest estimate of 1.125 million. Bloomberg pointed out hidden strength including “important good news” on October permits. In aggregate, that hardly looks like “important good news“. First time buyers, a strong indication of family formation, is at a three-decades low, and the NAR is “disturbed” about trends. Somehow that rule change had a huge impact in November but only a small (and not even mentioned) impact in October. That’s possible, but color me skeptical. Recall the hype over reshoring? Manufacturing jobs supposedly were returning to the US in droves from Asia. My view was that although some manufacturing processes returned, not many jobs came back thanks to robots and software automation. That view was far too optimistic. The second annual A.T. Kearney U.S. Reshoring Index shows that for the fourth consecutive year, reshoring of manufacturing operations to the United States has once again failed to keep up with offshoring. 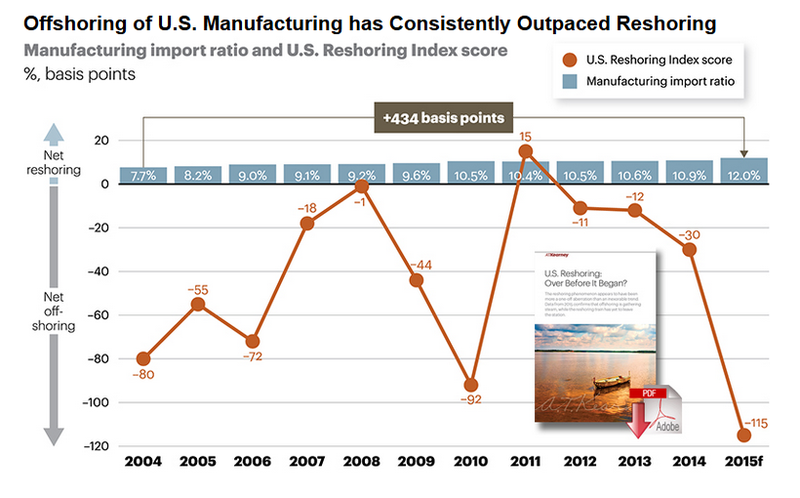 Supply Chain reports 2015 U.S. Reshoring Index Indicates Manufacturing Reshoring Trend Has Subsided. In 2015 the A.T. Kearney U.S. Reshoring Index dropped to -115, down from -30 in 2014, and represents the largest year-over-year decrease in the last 10 years. Even if the effect of raw material price declines is discounted by, conservatively, holding manufacturing input values constant relative to 2014 while ignoring that same effect on the value of offshore manufactured goods, the U.S. Reshoring Index would drop to -26, still supportive of the view that the widely predicted reshoring trend seems to be over before it started. Industries vulnerable to rising labor costs in China have been successfully relocating to other Asian countries, rather than returning to the United States. They have done so without incurring significantly higher supply chain costs, despite the weaker infrastructure and supporting ecosystems of these new low-labor-cost destinations. Vietnam has absorbed the lion’s share of China’s manufacturing outflow, especially in apparel. U.S. imports of manufactured goods from Vietnam in 2015 will be nearly triple the level of imports in 2010. The A.T. Kearney U.S. Reshoring Index and the U.S. Reshoring Database provide a number of insights on the factors driving imports of offshore manufactured goods and manufacturing reshoring. Many of the report insights run counter to the points of view and “hype” regarding reshoring of manufacturing to the United States. Surprisingly, some of the top sectors for reshoring from 2011 to 2015 are also sectors that have led the pack in further offshoring over that same period. The recent increase of nearshoring to Mexico also seems to indicate that, even if U.S. companies consider leaving Asia, they may choose to stop south of the border. The forecast strengthening of the dollar, the oil price slide, the tightening U.S. labor market in manufacturing and the Trans-Pacific Partnership (TPP), if ratified by the U.S. Congress, will likely further weaken the case for reshoring in 2016. Although reshoring of manufacturing by U.S. companies is on the decline, non-U.S. companies, including Chinese companies, increasingly invest in establishing or expanding their manufacturing footprint in the United States. The insatiable U.S. consumer market, the stable political and economic environment, and the benefit of tapping into America engineering skills and manufacturing know-how are main draws. For the casual observer, it is easy to get the impression that American manufacturing has entered a new and exciting period of revival. Many in the media, along with consulting firms, think tanks, and economists, now proclaim the emergence of a U.S. “manufacturing renaissance,” marked by the “reshoring” of production and the growing competitiveness challenges of many foreign nations vis-à-vis the United States. If only this were true. The Myth of America’s Manufacturing Renaissance: The Real State of U.S. Manufacturing, a new report by the Information Technology and Innovation Foundation (ITIF), assesses the true status of the American manufacturing economy and argues pundits have overestimated the impact of isolated incidents of reshored production and misread or ignored the data. If there were a true renaissance, we’d expect to see growth in inflation-adjusted manufacturing value added. But in fact 2013 manufacturing value added is 3.2 percent below 2007 levels, with non-durable goods value-added (which includes chemicals and oil and gas) down almost 12 percent. U.S. manufacturers employ over a million fewer workers and there are 15,000 fewer manufacturing establishments since the beginning of the Great Recession. Moreover, America ran a $458 billion trade deficit in manufacturing goods in 2013. Hardly evidence of a renaissance. And most of the recovery that has occurred has been cyclical in nature. In fact, 122 percent of manufacturing output growth between 2010 and 2013 was in the auto sector, whose growth is due almost solely to a rebound in U.S. consumer demand, rather than reshoring of automobile production. The first article, released December 21, 2015 is far more damning than the second, released January 14. A manufacturing recession has been upon us for six months.